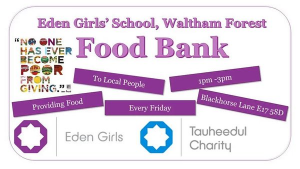 The food bank is managed by Ms Mayet and members of the Big Society team. Members of the local community visit Eden’s pupil run food bank every Friday to collect essential food parcels. The Big Society team have built long lasting friendships with regular clients and welcome new clients on a regular basis. The Big Society team meet every Wednesday to organise and sort the food that is delivered by Shine Charity. The food has to be processed in to food parcels ready for Friday’s food bank.